Phillip Denny: Your work, at least on a quick reading, has certain qualities that suggest a degree of extraversion, but that on second glance, reveal a greater attention to detail. How would you situate your work within this context of quiet versus loud architecture and the production of icons? Hugh Broughton: One time we were bidding for a project in a competition and the client asked two different people for their opinions. The client asked, “I’m thinking of using Hugh for my project, what do you think?” And so one person, a very respected architect in the UK, said, “Oh yes, he will be a safe pair of hands. You certainly won’t get something like a Zaha Hadid.” And then he went to the other person, who responded, “Oh Hugh will really challenge you.” And I quite like that, that sense of enigma. The work that we did in the Antarctic has changed me as architect fundamentally because it has helped me to realize that during the early creative process there are no limits to the thought process. That doesn’t mean that the answer you come up with isn’t restrained, simple, and something that sets itself in the background, like the Henry Moore Foundation Sculptures Store, but on the other hand, it allows one to work very carefully with the context of the project. 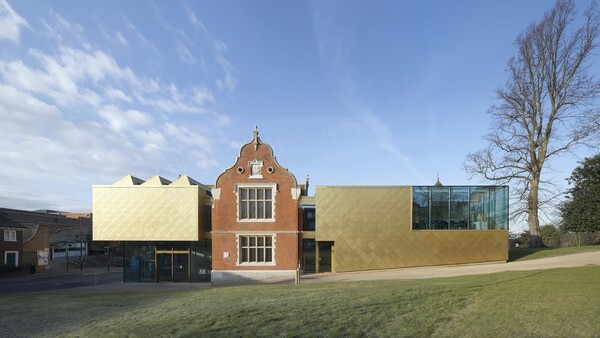 For example, we did a museum in the south of England, the Maidstone Museum, which we chose to clad in a gold-copper. That is a building that stands out, very, very clearly. When one describes it as a gold building, it sounds quite blingy, but actually, if you were to go up to the building, you would see that each of those shingles is hand-made and are all specially sized so that there are no strange cuts in the elevation. It is actually a very carefully crafted building that is weathering very beautifully, and we put a lot of work into making sure it would. We even took a trip to Graz in Austria to see one of the first gold-copper buildings, and saw all the places where leak marks occur, where staining occurs and discussed ways to prevent that on this building. So in a way, it is of the same family as a carefully crafted design, but it does make more of a statement. I don’t think it’s an icon, it’s just making a more powerful statement in a place which needed a more powerful response. It’s a context-derived architecture, but that doesn’t mean the buildings always have to be polite. Some contexts don’t demand you to be quiet. Sometimes they demand that you be a bit nosier. PD: When I look at the Maidstone Museum, it bears a superficial resemblance to certain projects of the firm Fashion Architecture Taste. Do you have any theoretical or practical affinities with the issues that they’re engaged in, like the use of unexpected materialities that are on the one hand, radical, but also sensitive in the way that they’re deployed? HB: I am empathetic with that approach, that is for sure, but I have never thought of myself as particularly associated with that way of working. I think a lot more carefully about the materials that we use in our architecture now than I used to and about the durability, longevity and the message that that use of materiality delivers. PD: So for you is the choice of material based more on performative factors or on rhetorical effect? HB: Oh, it's got to be both, it’s a conversation between the two. I think it would be impossible to choose solely based on one or the other. The intellectual challenge of architecture requires a marriage between those two lines of thought. PD: In a way, it's Ruskinian in the sense of rhetoric, performance and the evolution of the material over time? PD: In that manner, the Maidstone Museum is interesting because it uses a semi-flashy material deployed in a very contextual way, and that yields an enigmatic effect that’s not to be expected. Is enigma something that you consciously consider in your work, and what is its intended effect? HB: Like so many human experiences, I quite like the idea of revelation, so perhaps that’s why there’s a slight notion of enigma in the project. In my view, you don’t want to reveal everything in one big clear shout. That’s why in that respect, it's very far from being an icon. It’s a building with a clear threshold that then leads into a layered sequence of spaces; progression and layering are as important in architecture as in art, literature and as in music. That’s the kind of creativity that I enjoy. I’ve never been a “one-hit wonder”, which disappoints as much as excites. PD: In that sense, it seems you work often to integrate varied contexts into your projects, whether landscape and vernacular or artistic. Are there other contexts that you gauge when beginning a project? For example, when I look at the Henry Moore Store building, I’m reminded of the details in Norman Foster’s 1980s-era projects, which are articulated in a “just-so” way. Are there particular architects that influence your work? How do you engage architectural discourse? HB: I suppose that does hit the nail on the head of the kind of things that I am very interested in, in particular, the holistic approach to architecture, from concept to the most detailed aspects of the assembly. That’s probably why as a firm we don’t chase big master plan projects and why the scale of our work is relatively small. Because I’m interested in the whole process of making as well as in the architectural idea in itself, we prefer working on projects that demand a resolution at the most refined level. Perhaps that’s a very English thing. I’m not sure, but its definitely what fascinated the Arts and Crafts architects in the early 20th century, and in some respects, that new-Modernist school of Foster, Rogers, Grimshaw, etc. It’s in recognizing how that detail resolution adds a layer of human scale to a building. That’s always interested me. PD: How then would you react to the proposal that your architecture is a humanistic modernism? HB: Along with the Ruskinian description, I think that would describe my approach really nicely. Human scale to me is a very important consideration. Touch, color, texture and the human reaction to those factors, are all things that I consider very carefully. It’s why a very big building, built upon very broad ideas, would be hard for me to achieve, I think. PD: So do you think that you’re destined to work at a smaller scale? PD: Was your education important in engendering this approach? Can you talk about the history of your architectural education or what your influences were as a young architect? HB: Well I trained at Edinburgh University, and I suppose there were probably two people who influenced me the most during my architectural education. One was the Professor of Architecture at Edinburgh University at the time, Isi Metzstein. He used to run a practice in Glasgow called “Gillespie, Kidd and Coia” that produced some truly uplifting, spatially dynamic projects in the 1960s, including various churches and monasteries. He was an architect who understood the significance of the diagram, but also understood the progression from the diagram as you develop the architecture. He believed that the diagram is not enough-that architecture has to be invested in more than that. Nonetheless, in his view, relying only on the detail was not enough either. It’s a collusion of factors that makes good architecture. My other principal influence was an architect that I worked under. In the UK, the way that our architecture education is structured, after the first three years of education a student works for a year as an intern before going back to finish their coursework over the next two years. For my internship, I worked for a high-Modernist architect in London named Michael Manser. There, I was introduced to the simplicity of the high-Modernist period of architecture, think Mies rather than Corbusier, whose introduction subsequently revealed the very clear, very “head-down” approach of early ecclesiastic architects such as Robert Haddon. I suppose it’s there that I discovered the semi-spiritual form that you get at projects such as the Barcelona Pavilion or at Lake Shore Drive in Chicago. A few years ago, I visited Mies’s apartments there and looking at the tower blocks, it felt semi-spiritual in the way that everything is so perfectly resolved. The grid is the king and it is manifested at every single level. The craftsmanship involved in that I found really inspiring. I guess it was those two characters, with slightly different messages, that act as my foundation. 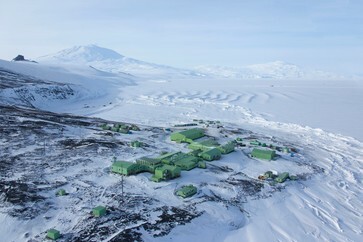 PD: With the example of the Halley VI Antarctic Research Station, you were involved in a project that necessarily made use of a broad range of consultants to help consider the numerous factors that were outside of your architectural expertise. Were you used to working on teams that required you to be constantly absorbing new kinds of information prior to working on the Antarctic project or was that new territory for you? HB: I’d say it existed previously, but not to the same degree perhaps. The Antarctic work was very good because even at the construction level, since many things hadn’t been done before, it was necessary to look to many different industries for inspiration. 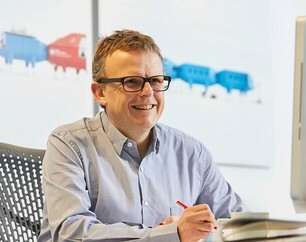 For example, within the construction industry, there wasn’t a solution for making a flexible connection between two buildings, but there was in the rail industry-when one joins together two train coaches. That was pretty straightforward. In the end, that project has helped me to cast around far more widely for solutions and probably for inspirations too. PD: Do you think that some of the lessons you learned on that project will come back and influence new projects? HB: Yes, yes, for sure, particularly the internal aspects of the project. We thought extensively about the introduction of natural light and the relationship between the inside and the outside as how you might in a project in a more typical context. With that building, I go to great pains to explain that while it looks like a space station, its design is actually relatively old fashioned. Like many other buildings, it uses light, volume and space, and crafts those around human activity in just the same ways people have been designing buildings for generations. However, because it had to respond to some very unusual site-specific constraints, such as freezing temperatures, isolation, the need to be relocatable - constraints that can only be resolved by harnessing technology - it gives a very specific architectural response. In fact, what that building does is puts together this new technology with old fashioned architectural thinking. Its appearance is not new for the sake of it - it’s a response. In that sense, it’s not an architectural party in its own right. PD: This interaction between technology and architecture that you mention brings to mind Le Corbusier’s famous maxim “the house is a machine for living”. What was your approach in resolving the relationship between the two? HB: It’s interesting probably because the application of the technology on the exterior of that building is very apparent. It does seem mechanical and we definitely chose to express rather than conceal those mechanics. This was also intended to subliminally give the scientists living there a sense of security derived from knowing that this was a machine designed to support them. However, because it had to be relocatable, the technology involved lent itself to a certain aesthetic. On the inside, that application of technology is there but it’s subverted far more than it is on the outside, and that was also intentional. The people that are there, isolated for long periods of time, need a place which feels comforting, which cocoons them, which supports them and is not challenging them - all at a human scale. I suppose it's those same sorts of concepts coming out again. PD: Are you aware of the Archigram-esque affinity of the Research Station project? PD: No, it's delightful actually, it's like a realization of the Walking City! So what is the relationship between the Walking City and our building? Even as we started, we knew that this was a building that would be raised up on legs and was going to have to move, which immediately led us to this modular solution. That all happened very, very quickly. Even after the first day of doing my very first sketches, I remember making a note, saying “Is this a walking city?” The Walking City wasn’t necessarily an inspiration but it was so clearly related that you couldn’t help but make the connection. I think it just goes to show how clairvoyant some of that thinking in the ‘60s really was. I was so pleased that Colin Fournier was excited by the project because I could imagine that it must be a great moment to realize that all that thinking they had carried out hadn’t been discarded and now is reality. But there were other influences as well, certainly a lot of practical constraints. There were a lot of very serious architectural considerations, and there was a lot of fun. We watched all the episodes of Star Wars and we sought out as much inspiration as we could. There’s a cartoon series called “Thunderbirds” that we looked to for a lot of that. There are some fantastic cut-away, cross-sectional books of the Thunderbirds, and we used those as inspiration in our drawing technique, so there was an element of light-heartedness about it. PD: I would interpret the composition of heterogeneous spaces in terms of choreography and procession, which again, speaks to the idea that your work tends towards a humanist viewpoint. How would you respond to architecture that is not wilfully humanist, what Eisenman calls the “post-human”, which is more cerebrally inclined, or isn’t engaging ideas of materiality and experience from texturally and touch interactions? HB: It so depends, but I’ve never felt comfortable in architecture derived purely from idea. That’s a very emotional response to that question. The idea in itself has never been enough. Nonetheless, the idea as a generator is a very interesting notion. I am a firm believer in singularity of concept, but that’s not enough, it needs more investment than that. I also recognize that we need variety though, and I don’t have an answer, I just have an approach. PD: In line with this humanist sensibility, can you talk about your views on the role that architecture serves to society and the public? HB: That’s my main incentive to carry on I think. I hope that’s reflected in the kind of projects that we do as well. I believe that you can see the important role architecture plays in society again and again. And so it saddens me when people have to say that the role of the architect is eroding or disappearing, because I view that as a sad commentary on society generally. Over time, we can see that the successes and failures of our urban environments derive so principally from the urban and architectural responses that compose them. We have it within ourselves to create the places that we feel most supported in. I don’t think architecture is becoming irrelevant. It may be currently practised in a different way, but it’s still hugely relevant. In that sense, it can be both creative and destructive in equal measure.